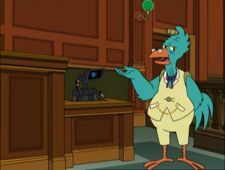 The Hyper-Chicken, a simple Alien from a backwoods asteroid, is the most frequently seen lawyer in Futurama. He is a father and has often defended and prosecuted members of Planet Express crew. Despite being incompetent, he often manages to win his cases and if he doesn't, he usually tells his clients to plead insanity. He seems to be a successful lawyer and handles large cases such as the destruction of DOOP's headquarters. Bender of spilling dark matter on Pluto. Bender and Fry of robbing a bank (New New York v. Fry and Bender). Farnsworth and Cubert of violating Bender's contract of ownership. (Mom v. Farnsworth). Bender of petty larceny, possession of something analogous to drugs and assault with a smelly weapon (New New York v. Bender). Bender of attempted murder (New New York v. Bender). Zapp Brannigan of blowing up DOOP headquarters (DOOP v. Zapp). Santa (really Bender) of crimes against humanity (New New York v. Santa Bender). Dr. John Zoidberg of eating the Earth flag (Earth v. Zoidberg). Clamps of almost killing Calculon. The Hyper-Chicken is modelled on Jimmy Stewart's Academy Award-nominated portrayal of lawyer Paul Biegler in Anatomy of a Murder. Trying a murder case in a small town, Biegler wins over the sceptical jury by repeatedly comparing himself, "a simple country lawyer", to the high-powered prosecutor, Claude Dancer (George C. Scott). The "simple country lawyer" became a model for many following portrayals, notably the entire show Matlock. It should be noted that another lawyer on the show, Old Man Waterfall, also is modelled on James Stewart. In a deleted scene, Amy once admitted to sleeping with Bender's lawyer. The scene may have been deleted because they remembered that this is his lawyer. The Hyper-Chicken advertises on buses, the ads simply read "ACCIDENTES! (800)λλλ-λλλλ". In a deleted scene on Into the Wild Green Yonder, Zapp Brannigan calls him 'Matcluck'. He crashed his hover car in "Proposition Infinity" when he misread Bender's graffiti, his feathers were seen flying from the wreckage. Presumably he was merely badly injured, as he reappears in a crowd scene in "The Mutants Are Revolting". The commentary for "Overclockwise" reveals that whenever the staff think they've run out of chicken puns to use for the Hyper-Chicken, the writers manage to come up with more. He is one of Matt Groening's least favorite characters. Hyper-Chicken: Now I may be just be a simple country Hyper-Chicken, but I know when we're finger licked. Hyper-Chicken: Son, as your lawyer, I declare y'all are in a 12-piece bucket o' trouble. Hyper-Chicken: Now, Pramala, I know it's scary up there in that witness box but, t'ain't no need to fear me... [He crows loudly.] I'm sorry. I thought you was corn. Hyper-Chicken: I was hatched ready! Honourable judge heads, yonder crawdad done ate up our flag. Judge Whitey: Counselor, what evidence do you offer for this new plea of insanity? Hyper-Chicken: Well, for one, they done hired me to represent them. Judge Whitey: Insanity plea is accepted. Hyper-Chicken: As the surveillance camera for the bank what all the judge was a-jawing about, could y'all tell us what you done seen the day of the crime? Hyper-Chicken: Your Honor, I move that I be disbarred for introducing this evidence against my own clients. Hyper-Chicken: Your Honor, the prosecution roosts. Ba-GAWK! Hyper-Chicken: Your Honor, that's something we cannot... a-doodle-doo. Judge Whitey: It strikes me as an extra-risky strategy. Hyper-Chicken: Did you say, "Extra-crispy recipe"? Judge Whitey: You know I didn't. Hyper-Chicken: Ah say ah say BACAWK!! This page was last edited on 17 September 2017, at 23:44.